Great article I thought I would share. Decoys can be invaluable aids to spring turkey hunters, giving wary gobblers something on which to focus their attention and keen eyesight and making it less likely an approaching bird will spot, or be spooked by, a hidden hunter. Testosterone is the most dangerous chemical under whose influence a wild turkey gobbler can find itself. But combining that behavior-addling hormone with another chemical – petroleum product polymers – significantly increases the bird’s chances of experiencing fatal consequences. Turkey hunters know this and use it to great effect during the spring hunting season. They are, after all, the ones who add the second part of the mixture: turkey decoys made of plastic or rubber or other similar, petroleum polymer-based materials. Employing turkey decoys can greatly increase hunters’ odds of success. And in many situations, the fakes can prove more crucial to sealing the deal with a long-bearded tom than convincing calling, good concealment or even turkey hunting’s two most important skills: woodsmanship and patience. That certainly was the case this past Saturday morning as Tim Stewart, Matt Gobar and I sat hidden just inside the rim of an island of live oaks surrounded by a pasture sprouting wildflowers and bunch grasses adjacent to a thickly forested creek bottom in Gonzales County. We’d slipped in before dawn, setting up near where Tim’s scouting had dead-on pegged a turkey roosting site. At least three toms sounded off, announcing to the world and especially any nearby hens they were the boss bird and the one the hens should covet as mates. As the birds left the roost, a few short yelps on diaphragm call and clucks on a slate call drew immediate responses from the gobblers. Things sounded encouraging. But as so often happens in turkey hunting, real hens complicated things. About 150 yards from our hides, a couple of hens walked out of the creek bottom, followed by a pair or strutting, gobbling toms. The gobblers trailed the hens as the female birds pecked and poked for breakfast. Calling a gobbler away from a group of hens is a tough assignment; toms are understandably loath to leave a hen in the hand for one in the brush. But we had an ace that played on the adult gobbler’s testosterone-fueled combination of aggression and lust. We’d staked a pair of turkey decoys about 15 yards from our hides before we settled in. One was an imitation hen. The other was a “jake,” a young, stub-bearded gobbler. A series of yelps and clucks drew the attention of the toms, and they spun in our direction, gobbling hard. Then they saw the decoys. The sight of a young gobbler in the company of a hen was too much for the adult birds. They abandoned the real hens, which had shown no interest in their amorous advances, and came strutting, drumming and gobbling toward us. The pair quickly closed the distance, ignoring the hen decoy and aiming straight at the jake. Both gobblers puffed up in full strut, one on each side of the decoy, poking out their chests and actually shoving the stoic jake in an attempt to intimidate him into abandoning the field and the hen. Matt and Tim fired almost simultaneously. Game over. We’d have never pulled those gobblers away from real hens without that jake decoy. Some spring turkey hunters shun using decoys. Reasons include a preference to depend solely on the art of calling to attract gobblers and a desire to avoid the hassle and additional weight that comes when carrying decoys. Also, high-quality turkey decoys can be a considerable investment; the Zink Avian X decoys we used this past weekend run about $80 for a hen, $100 for a jake and $120 for a fake adult gobbler in full strutting pose. But few turkey hunters deny that using decoys can greatly increase chances of success. Decoys are effective for a couple of reasons: attraction and distraction. A hen decoy can convince an approaching gobbler that the calls he heard were coming from a real bird, and he’s more likely to approach the potential conquest. While hen decoys play on a gobbler’s hormone-driven mating drive, gobbler decoys can trigger the competitive/aggressive reaction that is part and parcel of males juiced on testosterone. Gobblers instinctively want to challenge other males. Decoys also serve to distract gobblers. Turkeys have spectacular eyesight and ability to detect movement, as well as uncanny hearing. A gobbler looking for the hen he heard can easily “bust” a hunter who moves, even slightly, at the wrong time. But if the bird’s attention is on a decoy, chances of its spotting the hunter are considerably reduced. While turkey decoys can be a deciding factor in a hunt’s success, using them is not without its risks. To paraphrase University of Texas football coach Darrell Royal‘s famous line about why his teams rarely used the forward pass: Three things can happen when you use a turkey decoy, and two of them are bad. 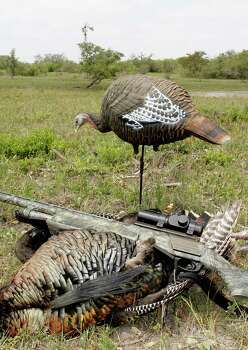 It is not uncommon for a gobbler to “hang up” when it spots a hen decoy. Turkey behavior generally dictates that hens come to gobbler, and not the other way around. So when a gobbler spots a hen, he sometimes will stand his ground, strut, drum, gobble and demand the hen come to him. If the bird “hangs up” out of shotgun range, the hunter faces what can be a long standoff that in most cases ends with the gobbler’s losing interest in the uncooperative hen and wandering away or, if the hunter tries to entice the bird closer with a few soft calls, results in the bird’s spotting the hunter and exiting with a series of alarm putts. Using a gobbler decoy is even more dicey. The sight of another gobbler, even a lowly jake, can trigger the “flight” side of the “fight or flight” reflex. Maybe the gobbler has had his tail feathers kicked by other gobblers or is just too worn out from chasing hens to fight another gobbler. But when using turkey decoys, positive results far outweigh the occasional negative outcomes.